“Imagine a world where love is the way. Imagine neighborhoods & communities where love is the way. 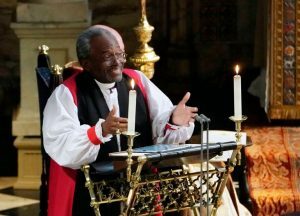 Bishop Curry is the First Black Presiding Bishop of the American Episcopal Church and gave a sermon for the Royal Wedding of Prince Harry and Meghan Markle that elevated the world’s imagination about the potential we have for good if we lead with love. My grandfather was a British History professor for 47 years. His deep knowledge and love for Britsh regalia were evident always, and in 1992, he graciously took his 8 grandchildren, 12 and under to England to accompany him on one of his numerous trips, which was my first trip to the Old Smoke. I was on the phone with him in the early morning hours during Prince William & Kate Middleton’s wedding and missed him this morning during Harry & Meghan’s ceremony. (He died last July). That’s all I have to say about that, but I couldn’t bring myself to write about the Royal Family without mentioning my grandad. 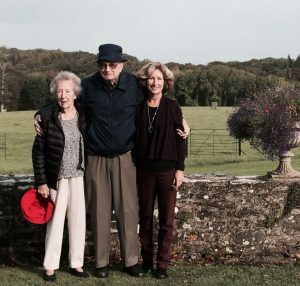 (pictured here on his last trip to England in 2014 with his wife and daughter). In just a few hours post delivery, Bishop Curry’s sermon is taking over the internet. For starters, that’s because of who he is. In 1619, the first captive Africans arrived in the British colony of Jamestown, Virginia. 399 years later, a descendant of African-American slaves (Curry), delivered the sermon at a British Royal Wedding. That’s pretty darn amazing, and likely out of the realm of imagination in 1619. (Thanks to Anand Giridharadas for that fact). Secondly, it’s sweeping the globe because of his brilliant use of imagination + love. Bishop Curry knows the Earth-shattering potential of love when employed not only as a feeling between two individuals on the altar but as the force that flows through humanity with the incomparable ability to reconcile, unify, and yes, even empower us to imagine. Bishop Curry himself stood before the world as a testimony to the progress that is possible when we lead with love + imagination. We must keep imagining. We must keep doing it with love. Oh! And maybe we should remember our history while we’re at it. Right, Grandad?